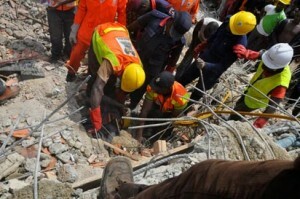 The Lagos State government yesterday said she is set to commence the prosecution of suspects linked to the collapse of a five-storey building on Tuesday, March 8, 2016, in Lekki, Lagos which caused the death of 30 persons. A statement signed by the State Attorney-General and Commissioner for Justice, Mr. Adeniji Kazeem, yesterday stated that the government has concluded all legal preparations to prosecute the nine suspects deemed culpable in the buildingâ€™s collapse. The statement read in part: â€œFollowing the conclusion of investigation by the Nigeria Police Force and technical reports of relevant experts, the Office of the Attorney-General has concluded its Legal Advice and decided to prosecute the suspects for failure to obtain Planning Permit contrary to the provisions of the State Urban and Regional Planning and Development Law, and Involuntary Manslaughter contrary to the provisions of the Criminal Law of Lagos State, 2015 respectivelyâ€￾. Meantime, the state government yesterday disclosed that no fewer than 2,300 buildings were constructed in the last one year across the state, even as it warned estate developers against erection of structures without approved plan permit. General Manager of Lagos State Physical Planning Permit Authority (LASPPPA) Mr. Remi Oni-Orisan, who gave the statistics, said that the number represented property owners who seek for building approval from January, 2016 till date.